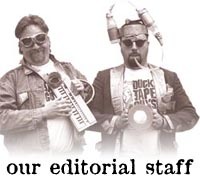 NEW BADGE of HONOR If you have sent us a duct tape story, photo, winning photo contest caption, etc. that we have used on our site, please feel free to grab the icon on the left and post it on your site and in your emails. You can link this badge of honor to http://www.ducttapeguys.com or a specific page on our site so your readers can easily find your contribution to our online tribute to the Ultimate Power Tool. Additionally, certain items cannot be carried onboard the aircraft and will not be allowed beyond security checkpoints. These items include knives/cutting instruments, all "non-safety" type razor blades, corkscrews, baseball bats, golf clubs, ski poles and hockey sticks. Which kind of struck us funny (for some reason). Additionally, you may not bring aboard toothpicks, paint brushes that have hardened lacquer type paint on them, batteries that are leaking acid, beer bottles, glass picture frames, pencils and or pens, pointed 1950-style bras, assault riffles, magic wands, air compressors, high-pressure truck washing systems, denture adhesive, super glue, duct tape, hand or electric egg beaters, hat pins, baseball caps with metal adjustable clasps, jack hammers, or toe nail clippers. Floppy disks, tie-tacks, screw drivers, car keys, metal dental work (e.g. braces, gold fillings), belts of any kind, yo-yo's, slinkys, kite string, g-string, nasal spray, liquid drano, hydrochloric acid (both diluted and undiluted), diamond rings, toe-rings, nose-rings, ringworm, ant farms, any biological weaponry, Barbie dolls (including Ken), poisonous snakes, bees, plutoniom, radioactive substances, nuclear or non-nuclear bombs, head bands, waist bands, marching bands, ankle bracelets, finger-nail polish remover, rubbing alcohol, Q-Tips (extra cotton padding Q-Tips are okay), machetes, matches, lighters, gasoline, fireworks (including but not limited to M-80s, sparklers, whistlers, bobcats, Roman candles (especially Roman candles) flamethrowers... pretty much anything with the word "fire" in it), any weapons that can be categorized under "mass destruction," laser guns, photon beams, ray-guns, gamma blasters, solar powered windmeels, can openers, sleeping gas, laughing gas, jet fuel, garbage bags, zip-lock bags, pre-1985 Tupperware, flatware, dinnerware, underwear (not being worn on person), any member of the African blood-sucking mambas (applies only to international flights), tarantulas, bats, racoons, mountain lions, and/or grizzly bears. If you do need these items, please plan to check them with your luggage. 3) Families are like fudge ... mostly sweet, with a few nuts. Heres your chance to get a Duct Tape Book for only 99¢! Buy any shirt from the Duct Tape Pro Shop (either a duct tape shirt or Parodyware shirt) and get an Ultimate Duct Tape Book for just 99¢ more. Thats a $6.95 value for just 99¢ - heck, its worth over $7 when we autograph it! Click on the 99¢ on the right to get to the deal. 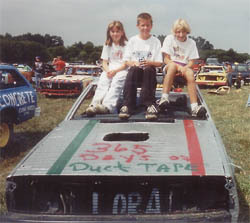 The new Duct Tape Photo Caption Contest is posted. Click the button on the left to see who won last months contest and to try your humor writing skills and creativity on this months photo. Good luck! Get stuck with this for FREE. Send us a self-addressed, stamped envelope (34¢ stamp - or base on 1 ounce for U.S. to Canada) and we will send you a FREE Duct Tape Pro bumper sticker. Address your envelope to: FREE Bumper Sticker NL, P.O. Box 130066, Roseville, MN 55113 (limit two per family please - include two self-addressed envelopes - one for each sticker). Duct Tape and Drumstick Tie Rod Repair Coming home from a concert in Seattle I broke a tie rod and the garage I called to come qouted me an estimate of $450.00 for the tow and repair. I bought a roll of Duct tape instead and tied the tie-rod in with a couple drumsticks and drove the 140 miles back to Yakima where I took it into a local shop and got it repaired for $39.00 plus the cost of a new tie-rod. Saved $350.00 thanks to duct tape. --- Walter and Lorraine M.
Warning: Potentially Lethal Bean Shrapnel I just read today's (1/15/02) recipe in my page a day Duct Tape calendar and am a little concerned because I have a feeling no one tried this recipe before it was published. As a kid, my friends and I enjoyed throwing canned vegetables in the fire, not because we liked hot, fresh veggies, but because it always resulted in an impressive explosion. A can of beans in a fire quickly turns into a thin-walled pressure vessel, and then a bomb. COLLEGE STUDENTS: We are still looking for the BEST DUCT TAPE DORM ROOM in the Country! Click the icon on the left to get full information about our new contest! HURRY! The deadline is March 28th, 2002. RANDOM WINNER: The random winner of a duct tape book in this issue is/was: Sophuichri@... Congratulations! Send us your mailing address and we will send you an autographed Duct Tape Book. Catch us in action! Check out our appearance calendar!